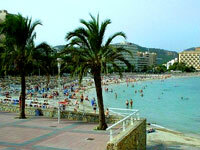 There are several good, though usually crowded, beaches accessible by bus from Palma. El Arenal, seven miles (11km) to the southeast of the city, attracts many German visitors to its waterfront restaurants, bars and hotels. The long beach boasts white sands and turquoise water. Palma Nova and Illetes, six miles (10km) to the southwest, are smaller but equally popular and picturesque beaches. On the road to Palma Nova is Marineland, offering dolphin, sea lion and parrot shows, as well as Polynesian pearl-diving demonstrations. Other beaches nearby include Portixol, El Molinar, Coll d'En Rebassa and Can Pastilla. The most popular beach on the entire island of Mallorca, Es Trenc, on the southeast coast between Cap de Salinas and Cap Blanc, can be reached by bus from the Plaza Espanya in Palma. Es Trenc is a long narrow beach which is not affiliated to any resort and is therefore less commercial than many others on the island - although its popularity ensures it is still frequently crowded. It is a beautiful stretch of sand and an unofficial nudist beach. The local tourist office distributes an information leaflet on 40 beaches in the Palma area, clearly demonstrating the wealth of choice for travellers in search of sand, sun and sea.